An excellent day trip from Zurich and close to the town of Schaffhausen, the Rhine Falls (Rheinfall) is the largest and most powerful waterfall in Europe, impressive not so much for its height of 75ft (23m), but more for the volume of water thundering over its broad breadth. This natural wonder is especially remarkable during spring, when the snowmelt adds to its volume. On the hill above the falls is a medieval castle, Schloss Laufen, housing a restaurant, shops and a hostel. Rainbow-coloured mists rising from the forest and encircling the castle create an enchanting atmosphere. In summer one of the highlights of a visit to the falls is a boat trip across the white-water of the cataracts to the Centre Rock, with a short climb up some stairs to the top for an exhilarating view of the rushing water. Breathtaking views can also be enjoyed from three different lookout platforms along a path leading from the castle. 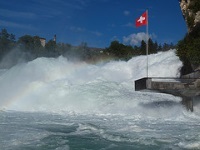 The Känzeli Lookout, with a protruding platform at the base of the falls, is the most spectacular. The Rhine Falls is host to the fantastic fireworks display held on Swiss National Day (1 August) that attracts thousands of spectators every year. Transport: By car and by train (Rheinfall Neuhausen).